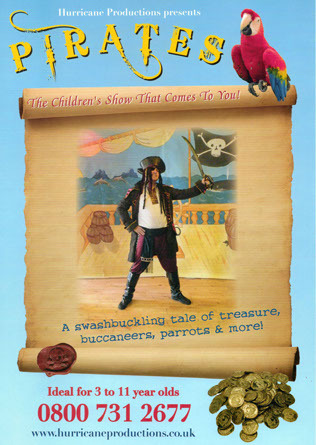 All the world is made of magic, and trust, and pixie dust; fly to the world of Neverland with Peter Pan friends on a swashbuckling adventure on the high seas. Meet the infamous Captain Hook as he tries to steal the lost treasure of Skull Island. Will Tinkerbell save the day? Or why not venture to Sherwood Forest, and join Robin Hood as he battles the treacherous Sheriff of Nottingham and Prince John. This evil duo are robbing the poor to feed the rich by collecting high taxes to line Prince John’s greedy pockets. Book our brand new madcap medieval show now for Summer 2019! Join Robin Hood as he battles the treacherous Sheriff of Nottingham and Prince John. This evil duo are robbing the poor to feed the rich by collecting high taxes to line Prince John’s greedy pockets. Will Robin Hood save Maid Marion and the merry men from the sheriff’s evil clutches? Join us for our brand new fast-paced medieval adventure Robin Hood. 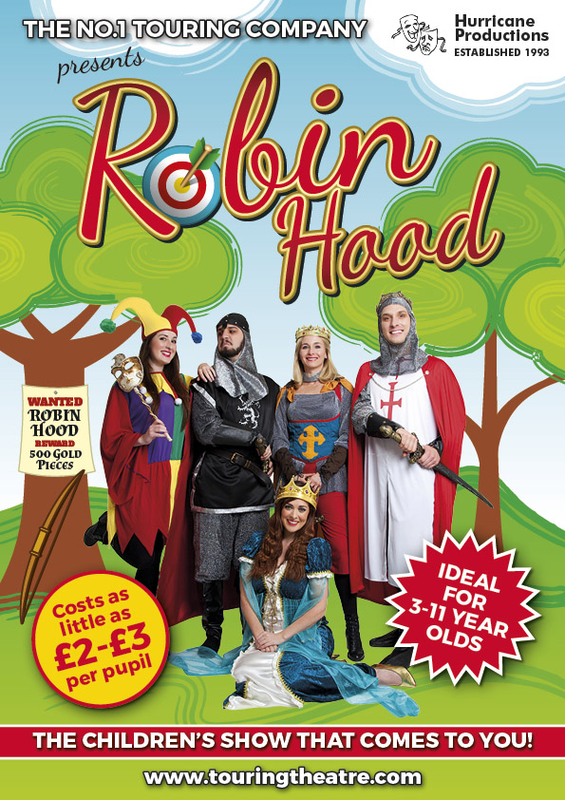 Robin Hood is a theatrical experience the kids will love and will help to stimulate their minds through drama! 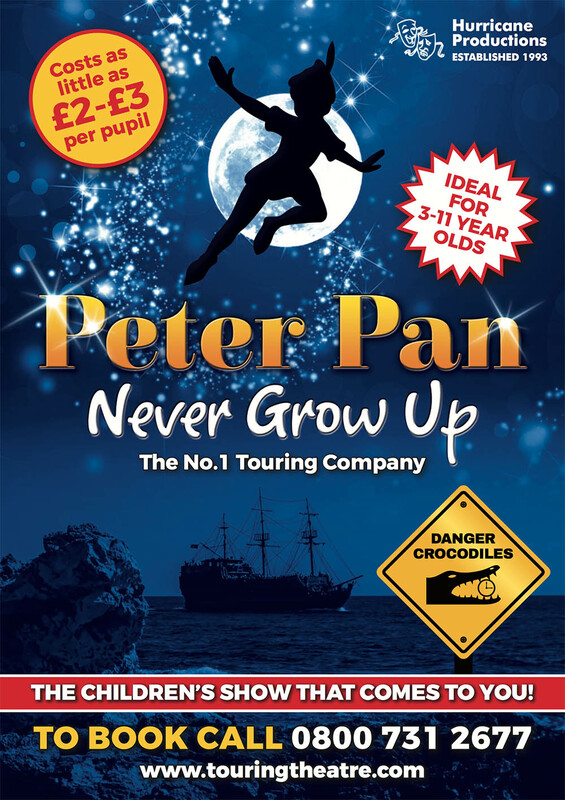 Take a trip with us to Neverland, and book now for Summer 2019! 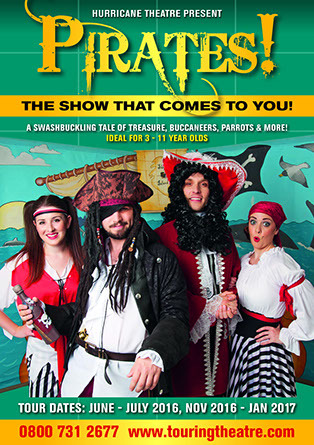 Join Peter Pan and friends on a swashbuckling adventure on the high seas. Meet the infamous Captain Hook as he tries to steal the lost treasure of Skull Island. Will Tinkerbell save the day? 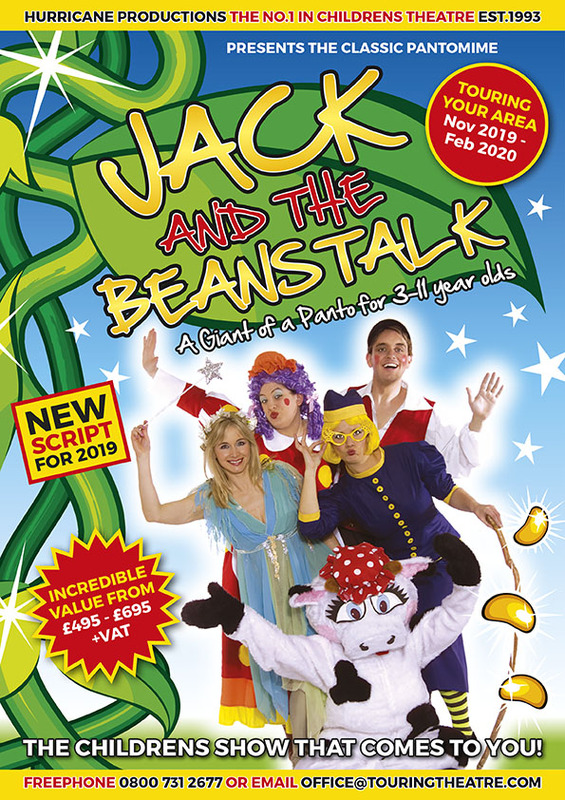 Climb to the skies with Jack and the Beanstalk for Christmas 2019! Fee! Fi! Fo! Fum! I smell a panto that’s full of fun. 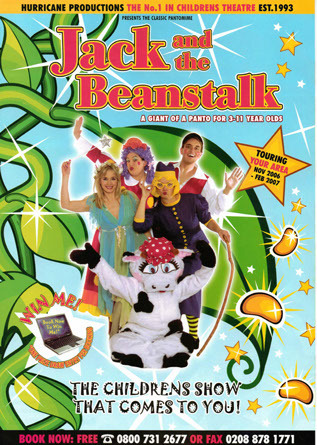 Jack has swapped Daisy the Cow for a few old beans, and Dame Trott isn’t happy. 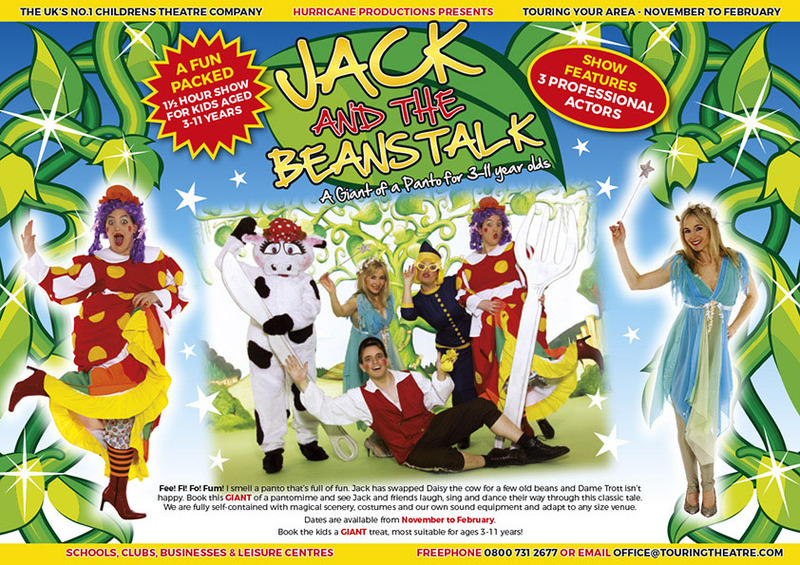 Book this GIANT of a pantomime and see Jack and his friends laugh, sing and dance their way through this classic tale. Welcome to Hurricane Productions, the UK’s leading touring theatre company. We pride ourselves on our outstanding theatrical shows, professional actors and unrivalled reliability. 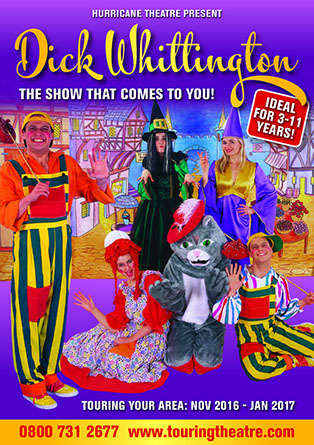 All our shows are written in-house for children aged 3-11 years (suitable for Key stage 1 and 2). We specialize in bringing the wonders of live theatre to your venue; we bring scenery, beautiful costumes, magic tricks and audience participation. With our adaptable scenery we can perform in any size venue to absolutely any size audience. "It was amazing, the kids (and adults) loved it!" 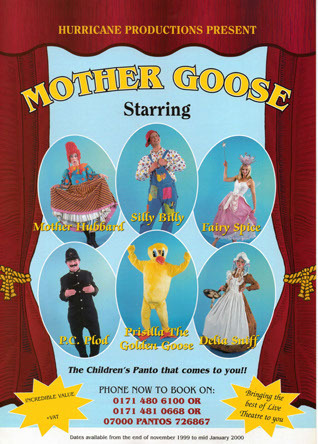 "A great show, the children really enjoyed themselves. Thank you!" "100 out of 100. My best day at school ever." 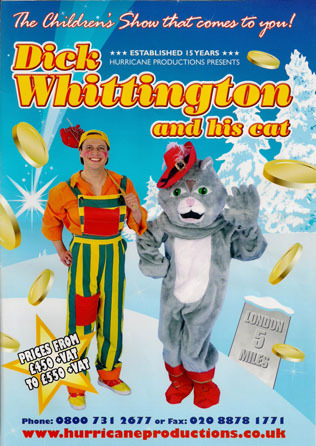 "A wonderful performance - very much enjoyed by staff and children. Thank you." "400 children absolutely enthralled - as were all the staff. Brilliant." 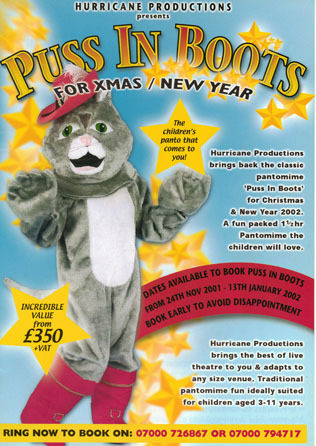 Hurricane Productions is one of the leading producers of touring theatre for children in the UK. All you supply is the audience. 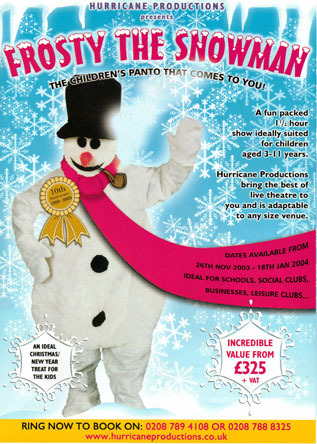 Hurricane Productions adapt to any size venue and all our productions are aimed at children aged 3-11 years old. 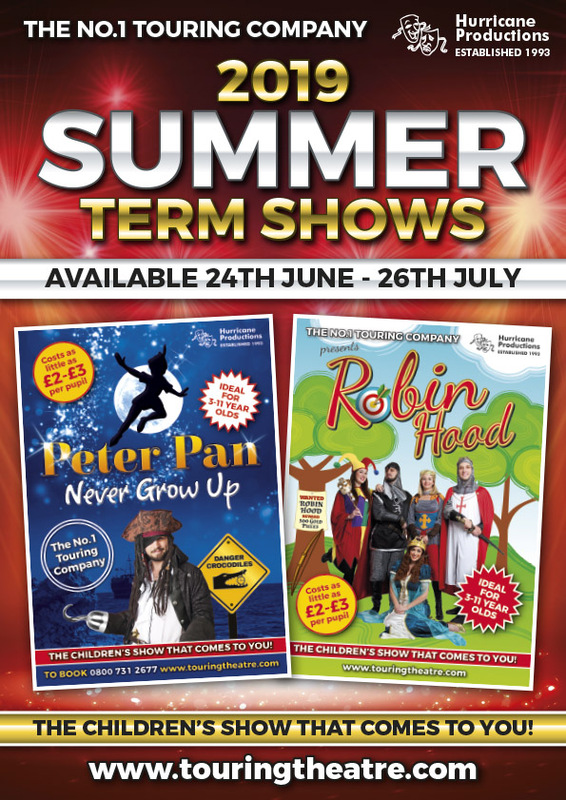 Why not book one of our shows and take the hassle out of taking the kids to the theatre? No coach hire or expense, traffic queues or worry, as our actors set up in your venue. Established for over 20 years, we have performed to over 3 million primary school children at over 15,000 venues across the UK! Over 15% of adults have seen one of our shows! Whether a school, business, leisure centre, sports club or party, let us come and entertain you! All of our actors are professionally trained and selected from Britain’s leading drama schools; Rada, Italia Conti, Mountview, Guildford School of Acting, DSL and BSA to name a few.